Steamed pork buns are an absolute must-have when you go to a dim sum restaurant. The sweet and rich flavor of the barbecued pork, housed in a light and fluffy bun, is something to behold. If you've never had the pleasure of having dim sum, we encourage you to try it. Think of it as the Chinese version of Spanish tapas. You can go and order a variety of smaller plates that you can share with your table. A lovely way to broaden ones horizons and try new dishes, without feeling like you have to commit a whole meal to one item, that you are not sure if you will enjoy. This way, you can try a bunch of different items and perhaps find a new dish that you never would have thought you'd really like. Win-win! 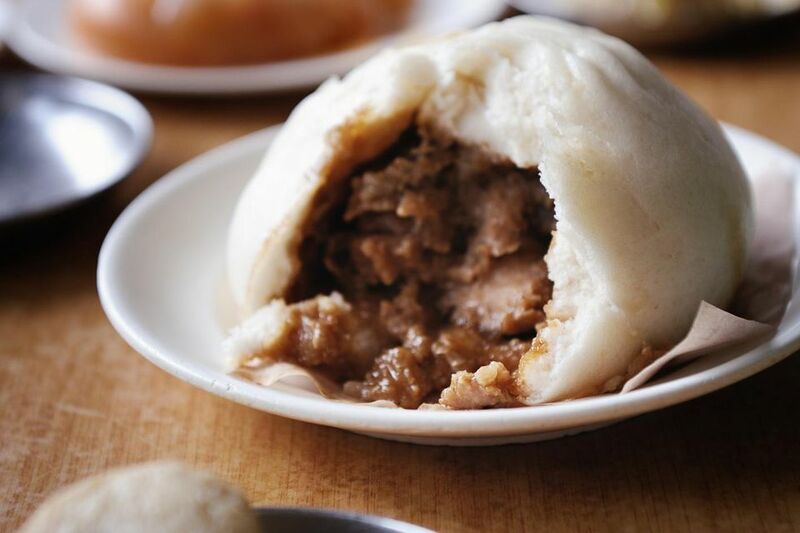 If you happen to really enjoy the pork buns, also known as Char Siu Bao, then the below recipe is a great way to create these delicious buns at home. The recipe happens to be courtesy of Sylvia Schulman's cookbook, Madame Wong's Long-Life Chinese Cookbook. Note: while there are multiple steps to this recipe, this steamed pork bun dish is broken down into workable categories to help you better plan for preparation and cooking. Add 1 cup of flour and mix thoroughly. Cover with cloth and let rise 1 hour, until bubbles appear. Dissolve sugar and vegetable oil in 1/2 cup boiling water. Stir well. Cool until lukewarm, then pour into yeast mixture. Add 3 1/2 cups flour and stir. Knead dough on lightly floured board until smooth. Put into extra large, greased bowl in a warm place. Cover with damp cloth and let rise until double in bulk, about 2 hours. Heat 2 tablespoons oil in wok. Stir fry scallion and garlic 30 seconds. Add pork and stir-fry for 1 minute. Pour the dissolved cornstarch into the wok. Stir-fry quickly until pork is glazed. Remove to bowl and allow to cool. On a floured board, knead dough 1 minute and roll into one long, sausage-like roll 2 inches in diameter. Slice the roll crosswise into 1-inch pieces. Flatten each piece with the palm of your hand and roll with rolling pin into 3-inch rounds. Place 2 tablespoons of filling in center of each round. Gather dough up around the filling by pleating along the edges. Bring the pleats up and twist securely and firmly. Place each bun on 2-inch square of either parchment paper or aluminum foil on a steamer tray. Cover with a towel. Let rise 1 hour, until dough springs back when touched with finger. Remove towel and steam over briskly boiling water for 10 minutes. This dish can be prepared in advance. Make the buns, fill them, and steam them, as you would normally. Then freeze them in a ziploc bag. When ready to eat, thaw out the plastic bag and re-steam for 10 minutes.